Armed with some of the background information and history on PCIe 4.0 electrical compliance testing, we're now ready to look at just what it takes in terms of test equipment to determine compliance for a PCIe 4.0 device. With the increase in data-transfer rate from 8 Gb/s in PCIe 3.0 to 16 Gb/s in PCIe 4.0, so too have the test equipment requirements advanced. 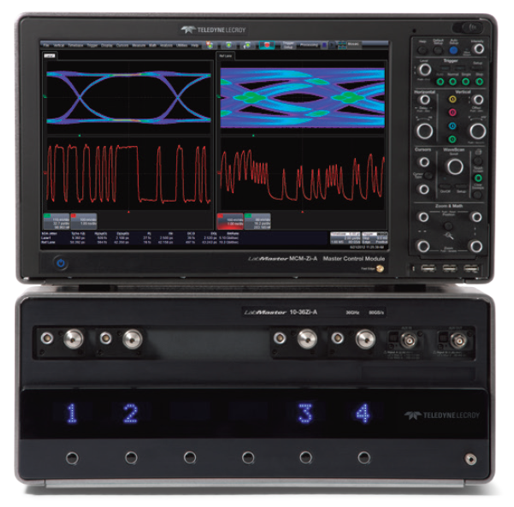 The element common to all of the tests in the PCIe 4.0 test specification is a high-bandwidth, real-time oscilloscope. The required bandwidth for Card ElectroMechanical (CEM) specification testing is stipulated by PCI-SIG in the test specification itself. For PCIe 3.0, the stipulated oscilloscope bandwidth is 13 GHz, and that rises to 25 GHz for PCIe 4.0. We recommend our LabMaster 10Zi-A, which is nominally a four-channel instrument with real-time bandwidth of 25 GHz and sampling rate of 80 GS/s. The LabMaster 10Zi-A provides an upgrade path to bandwidths of 36, 65, and 100 GHz, future-proofing any subsequent PCIe 5.0 development needs. PCIe 4.0 receiver tests require a similarly well-equipped bit error-rate tester (BERT). 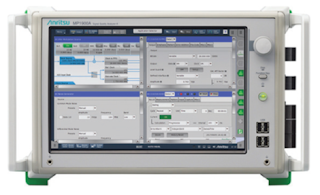 One such instrument is Anritsu's MP1900A signal-quality analyzer, a multi-channel BERT with support for all earlier PCIe generations (Figure 2). Like the LabMaster 10Zi-A, the MP1900A also provides enough horsepower for the upcoming PCIe 5.0 test specification. The MP1900A supports bit rates from 2.4 Gb/s to 32.1 Gb/s across up to 16 channels while also offering the requisite facilities for link training and equalization as well as link-training and status state machine (LTSSM) analysis. It provides all equipment necessary for PCIe testing: synthesizer, jitter generator, noise generator, pulse pattern generator, and error detection. Thus, no other external test equipment is required. Another key piece of the PCIe 4.0 test puzzle is test automation software. Teledyne LeCroy's QualiPHY PCIe4-Tx-Rx compliance suite can run directly on the LabMaster 10Zi-A or on an external PC (Figure 3). The software automates all of the PCIe 4.0 testing, including collection and analysis of waveforms for transmitter test, BERT calibration and jitter tolerance for receiver test, and link equalization testing. For each test in the specification, it provides connection diagrams to guide users through test setup and generates test reports with pass/fail results and margins. It also can be integrated with external test automation through its Host Program Control feature. Test fixtures are also central to most, if not all, protocol compliance testing. When it comes to PCIe, test fixtures are available only from PCI-SIG itself. Note that for PCIe 4.0 testing, there are new fixtures, and you won't be able to press any existing PCIe 3.0 fixtures into service. One handy feature of the PCIe 4.0 compliance base board (CBB) is the inclusion of dedicated automation-control headers, allowing the fixture to be controlled externally. This encompasses such functions as power-on, power-off, device reset, and toggling through various settings. To facilitate external CBB control, Teledyne LeCroy's TF-PCIe4-CTRL CBB automation controller connects directly to the oscilloscope and sits between it (with the test automation software in control) and the CBB for complete automation of the testing. 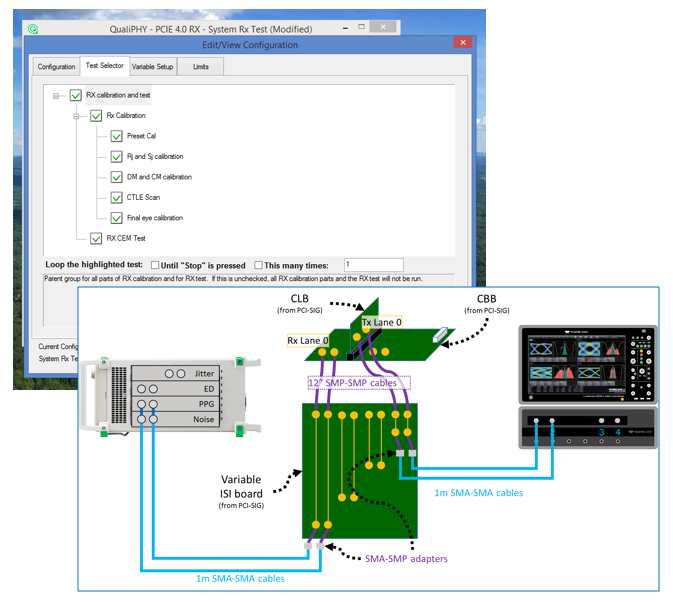 Figure 4 wraps things up with a table showing how the capabilities of the LabMaster 10Zi-A oscilloscope and MP1900A bit error-rate tester map to the equipment requirements of the PCIe 4.0 test specification. Our next installment will provide a detailed look at the transmitter electrical tests.